The movie Crazy Heart won big at last night's 82 annual Academy Awards. Not only did Jeff Bridges score a well-deserved Best Actor Oscar as the down-and-out country star, Bad Blake, but the The Weary Kind, co-written by Ryan Bingham and T Bone Burnett, was named Best Original Song. It was the first win for both Ryan and T Bone; Burnett previously was nominated alongside Elvis Costello for Scarlet Tide from the movie Cold Mountain in 2004. Ryan, who records for Nashville's Lost Highway Records, thanked his wife during his speech, saying he loved her "more than rainbows." 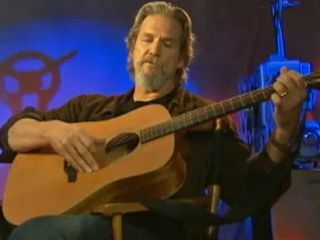 Check out the video below in which Bridges, who did his own singing and guitar playing in Crazy Heart, performs The Weary Kind. Multi-talented? We think so.